Music therapy helps students to become more confident, creative and expressive. Sessions are normally 1:1 but small group work is set up according to need. Students are encouraged to express themselves through live and mostly improvised music, song-writing, composing, singing and playing. The aims of music therapy include helping students to: develop a better understanding of, and manage their feelings; increase their concentration; improve their social skills and decrease tension and anxiety. 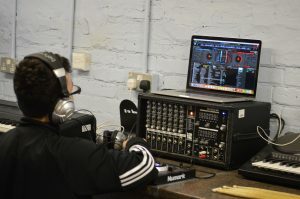 Musical skills which students acquire through sessions can be accredited by AQA unit awards.